Colleagues and children of the late Stephen Hawking gathered Oct. 15, 2018 at London's Science Museum to discuss his final book, "Brief Answers to the Big Questions." During a panel discussion held Oct. 15 at the Science Museum in London, Hawking's children and colleagues talked about the new book, called "Brief Answers to the Big Questions" (Bantam), and Hawking's lasting impact after his death in March. From left to right: Tim Hawking, Lucy Hawking, moderator Roger Highfield, Malcolm Perry, Andrew Strominger and Fay Dowker gather for a discussion of Stephen Hawking's life and work at London's Science Museum on Oct. 15, 2018. "This is almost a response to the response to 'A Brief History of Time,'" Lucy Hawking, the scientist's daughter, said during the panel. "For 30 years my father's been regularly asked questions on a number of existential or scientific or … social questions, and given these very clear responses." Hawking came up with the concept and started the book before his death, but his family and collaborators pulled together the final collection of his answers, according to the panelists. "He says in the book, people want answers to the big questions, and it was really important to him that he answered all these questions in a way that was accessible, that was engaging, that was entertaining, and that people could relate to," Lucy Hawking said. "He was very keen on creating relevance for people with abstract concepts, and I think that's something this book does in an absolutely fantastic manner — I know people who've looked through the book and said, 'It feels like he's written this for me; I didn't expect that.'" Besides the book's release, Hawking's final paper, on the black hole information paradox, was recently published by his colleagues in the preprint journal ArXiv. The paper dealt with an issue Hawking grappled with for years: how to reconcile the fact that black holes slowly evaporate over time, which he discovered, with the idea that the information within them would someday be lost. "It's a huge problem that Stephen gave to us," Andy Strominger, a physicist at Harvard University and co-author on the paper, said during the panel. 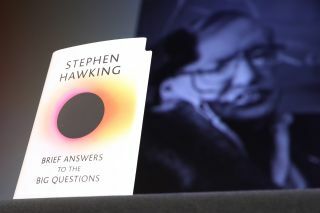 "Stephen understood how to put the theory of black holes together with the theory of quantum mechanics, and from that derived the formula which is now on his headstone in Westminster Abbey, which essentially says how many gigabytes [of information are stored] in every black hole that we see up in the sky. And our job is to explain this formula, and it was hard to explain because we had been told that black holes were bald, featureless objects." During a panel Oct. 15, 2018 at London's Science Museum, panelists discussed Stephen Hawking's new book and his work. This still comes from a short video explaining his final research into black holes. But then, in 2015, Hawking and his collaborators discovered a mechanism by which a black hole might be able to store information at its surface, using ghostly particles with no mass, referred to as "soft hairs." Now, Hawking's collaborators are left to finish tabulating whether those particles could store enough information to dodge the conflict with quantum mechanics. "This is what we're very excited about trying to understand in greater and greater mathematical detail," Strominger said. "And this paper which came out last Tuesday is a great step in that direction." Hawking's former student Fay Dowker, now a theoretical physicist at Imperial College London, discussed how Hawking showed the public the importance of scientists, and also brought scientists together across disciplines. "We've lost perhaps our most powerful advocate for the value and importance of fundamental research in physics and science," Dowker said during the panel. "But as the physics community itself, internally, Stephen was a very powerful binding force in that community. At his large birthday conferences, many people would come, drawn by love and respect for Stephen, from an enormous range of different areas, all touched by his work." According to Timothy Hawking, Hawking's son, this new book pulls together themes Hawking has touched on throughout his career in popular science — not to mention in discussions at the dinner table. It seems poised to connect with a public looking for the guiding force of science in the world today, from a man whose name has become synonymous with the cutting edge of science. "If you had to sum up this book, I would say it's a call to unity, it's a call to humanity, it's a call to bring ourselves back together and really face up to the challenges in front of ourselves and try to work together to find a solution," Lucy Hawking said. "I think that reading through the book again, it's almost like his voice has been leaping off the page as I've been reading through the chapters, and it's been very nice to connect with him again in that way," Timothy Hawking added.